New Delhi: While presenting the first budget of the ruling Bharatiya Janata Party government in 2014, finance minister Arun Jaitley had remarked that the budget is the most comprehensive action plan of a government. The new India envisioned, would focus on rural development, employment through infrastructure creation and provision of quality public services by 2022. Four years later, a look at the government’s financial commitments to the social sector in the interim budget presented on February 1, 2019 suggests that it still has no clear idea on how to realise its vision. Our conclusion is based on the comparison of allocations for flagship welfare schemes between 2018-19 and the newly announced interim budget. The interim budget for rural development department saw only a 5% increase from the revised estimates of 2018-19, which remained unchanged despite a Rs 4,000 crore increase for Mahatma Gandhi National Rural Employment Guarantee Scheme (MGNREGS). A breakdown of schemes-wise allocations puts this change in perspective. The allocations for the Pradhan Mantri Gram Sadak Yojana (prime minister’s rural roads programme), in terms of budget estimates, have remained constant since 2016 at Rs 19,000 crore. Similarly, allocations for MGNREGS after increasing 11% in the revised estimates of 2018-19, as per government reports, again fell by 1.8% to Rs 60,000 crore in the interim budget. Similarly, allocations for the Pradhan Mantri Awaas Yojana (PMAY-G, prime minister’s rural housing scheme) decreased by 13% in the revised estimates for 2018-19 and another 5% this year. This is despite allocations being less than the minimum requirement: Between November 2016 and March 2019, Rs 58,900 crore has been allocated for the scheme, 24% less than the approved share. If to this we add the fact that not all funds allocated are released, it becomes clear that the money made available by the union government is even lower. This shortage is reflected in the delays in payments to beneficiaries. Of the beneficiaries who had completed construction between April 2014 and December 31, 2018, 1.04 million were yet to receive their final installment, Accountability Initiative found. With another 3.64 million houses to be completed and inspected between January 2019 and March 2019, it remains to be seen if government will meet its 10-million target. The government’s health strategy has broadly focused on three things: Ensuring free drugs and diagnostics, creating health and wellness centres (HWCs) to reinvigorate the failing rural health infrastructure evident from Rural Health Statistics 2018 and addressing the shifting of disease burden to non-communicable diseases and finally, covering 107 million poor families with an insurance cover of Rs 5 lakh for inpatient care under the Ayushman Bharat scheme. The interim budget brings good news for Ayushman Bharat with allocations increasing to Rs 8,000 crore from Rs 3,600 crore in 2018-19 revised estimates. However, this comes at a cost, as IndiaSpend predicted: About Rs 30,130 crore was allocated for the National Health Mission (NHM) at the start of 2018-19, which increased marginally to Rs 30,683 crore in the revised estimates. The interim budget has committed another Rs 1,062 crore. But the sum remains 9% below the projected plan outlay of Rs 34,882 crore for 2018-19. “The lack of the financial commitment for translating healthcare goals into action is evident from the fact that though the government expenditure on health sector has marginally increased as a percent of GDP [gross domestic product] over the years, it has stagnated at around 1.2% of GDP and the current pace of the year-on-year budgetary allocation for health is unlikely to reach the targeted level of 2.5% of the GDP by 2025,” the 106th Demand for Grants report of the department of health and family welfare had remarked in March 2018. The inadequate increase is likely to affect expansion and strengthening of health facilities to meet norms and the implementation of new interventions, the report further warned. The increasing allocations since 2014 for Swachh Bharat have come at the cost of drinking water. India faces the worst crisis in its history with nearly 600 million Indians facing high-to-extreme water stress, and 21 Indian cities set to run out of groundwater by 2020. After many years of prioritising allocations for sanitation, it was expected that the interim budget (or at least the revised allocations for 2018-19) would finally indicate a shift. With government data reporting 92 million toilets already built, the decline in Swachh Bharat Mission-Gramin allocations was expected. Yet, surprisingly, allocations for the National Rural Drinking Water Programme (NRDWP) have not changed significantly. Instead, allocations decreased by 22% from the budget to the revised estimates for 2018-19. The interim budget sees a 17% increase over the 2018-19 budget estimates. The government’s own data show that only 44% of rural habitations are provided drinking water at 55 litres per capita per day (lpcd) as on January 1, 2019, up from 43% in 2014-15, reported Accountability Initiative. India’s commitment of ensuring piped water supply to 80% households by 2020 remains elusive given that coverage was only 18% as on December 31, 2018. Child and maternal malnutrition continues to be India’s leading risk factor in 24 out of 30 states for which data were available, as per the ‘India: Health of the Nation’s States’ report. India’s answer to this has been in the form of the decades-old scheme--the Integrated Child Development Services (ICDS)--and maternity benefits in the form of the Pradhan Mantri Matru Vandana Yojana (PMMVY, prime minister’s maternal welfare scheme). Let’s start with the positives. The core ICDS scheme has seen a 17% increase in allocations in the interim budget for 2019-20, driven primarily with the increase in honorarium for anganwadi workers. While the 2018-19 figures remain below the amount projected by the ministry of women and child development of Rs 18,007 crore, the latest allocations are a much-needed boost to a sector which has seen a decline in the number of beneficiaries getting supplementary nutrition. In contrast, the maternity benefit scheme--a legal entitlement for all women (except those already covered in the formal sector) under the National Food Security Act 2013--has seen a mixed picture. In 2017, the government launched PMMVY to provide a cash benefit of Rs 5,000 to pregnant women after meeting certain antenatal care conditionalities. The scheme was later restricted to the first live birth. 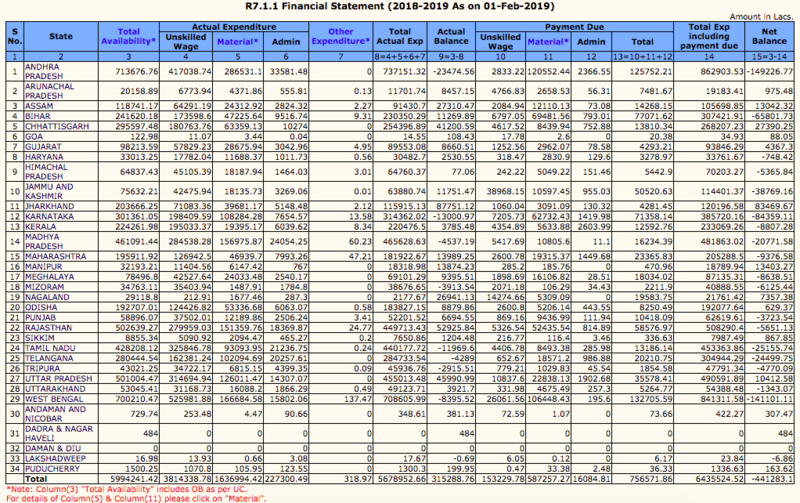 Allocations, however, have been falling from Rs 2,700 crore in 2017-18 budget estimates to Rs 2,400 crore in 2018-19 budget estimates. This was reduced by half in the revised estimates to Rs 1,200 crore. With allocations in the interim budget below even the 2017-18 numbers, a scheme already criticised for its under-funding will be further squeezed.